Expertise Browser is a tool to find domain experts for a set of software artifacts and to inspect their expertise profile. It links individuals or organizations with the software artifacts via experience atoms (modifications) made to the software. Expertise Browser demos for Mozilla and Open Office. 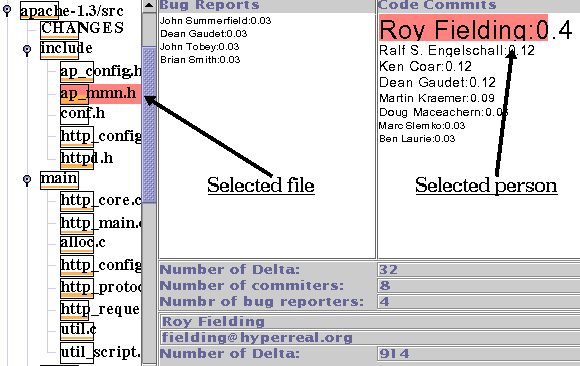 The input for the browser is prepared via expertonDir.perl script that takes a list of changes as input. It also needs a file that describes attributes of individuals making these changes. The code for the applet itself and Mozilla related tools are also available.